Is Your Second Brain Addicted to this Substance? So many people are still under the mistaken impression that it is fatty foods that have caused the ever-growing obesity epidemic, but the real villain has been exposed: sugar. In 1960, 33 percent of the U.S. population was considered overweight and 9.7 percent clinically obese. According to the latest report by the Centers for Disease Control, today the obesity rate has skyrocketed to 35.7 percent. It was in the 1980s that health experts began to identify obesity as a growing problem. World-renowned British scientist Professor Philip James was one of those who noticed that people were getting fatter with no explanation. Even individuals who exercised and consumed low-fat foods were gaining weight, but no one had yet connected the dots between high fructose corn syrup and fat. Researchers also began to notice that the more sugar we consumed, the more we wanted and the hungrier we became. When studying lab rats that ate traditional rat food, it was found they put on weight normally, but when rats ate processed food they ballooned rather quickly. Their appetite for sugary foods was said to be insatiable. Scientists say that the gut is a highly complex nervous system, the body’s “second brain,” that becomes conditioned to wanting more sugar. It sends messages back to the brain that are impossible to fight. A book written by Dr. Robert Lustig, “Fat Chance: The Bitter Truth About Sugar,” is said to have caused a backlash from the food industry. Lustig is a pediatrician who specializes in treating overweight children in San Francisco. He’s spent 16 years studying sugar’s effects on the central nervous system as well as metabolism and disease. Lustig says that the industry has turned sugar into a diet staple, because they know it works to hook consumers into buying more. He notes, “If some unscrupulous cereal manufacturer went out and laced your breakfast cereal with morphine to get you to buy more, what would you think about that?” They do virtually the same thing, but with sugar. Lustig also compares sugar to controlled drugs. He says cocaine and heroin are deadly because they are toxic and addictive. So is sugar. But he doesn’t say that eating a mountain of burgers is okay either. The point he is making refers to insulin. Foods that raise the body’s insulin levels too high are the real issue and perhaps responsible for 75 to 80% of all obesity. Insulin is the hormone that causes energy to be stored in fat cells; sugar is the most egregious, but other categories such as trans fats, alcohol and dietary amino acids are also responsible. Amino acids are found in corn-fed American beef and not grass-fed beef. The cows are fed corn to fatten up quicker resulting in muscle insulin resistance, creating the same disease humans have. The bottom line in Lustig’s message, as well as many other food scientists and health experts, is that cheap sugar is endangering lives. Just cutting calories doesn’t work; where that calorie comes from is also important. The effect of a calorie from sugar is different from the effect of a calorie from lean, grass-fed beef or whole organic foods. Added sugar is frequently disguised under a myriad of different names; avoiding processed foods is one of the easiest ways to avoid cheap sugars from glucose to dextrose, malt syrup and fructose; high fructose corn syrup is considered to be the biggest culprit of all. 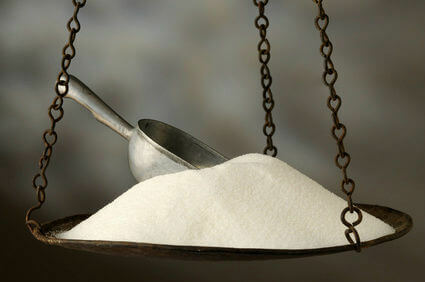 For some people, breaking free from sugar is one of the hardest things they have ever had to do. If this is you, here five tips to help you end your sordid love affair with sugar. Understand your sugar triggers – We all have them, what makes you go for the sugar. This could be stress, hunger, boredom etc… Keep a food diary and make a note of when you crave sugar. Eat nutrient dense food – Fill your body with whole food, rich in healthy fats and organic fruits and vegetables. A well-nourished body craves less sugar than one that is nutrient deprived. Start your day with a savory breakfast– A hearty breakfast that contains healthy saturated fat will help keep the sugar cravings at bay. Choose an omelet or a bowl of oatmeal with real butter or cream over a dry cereal or a bagel. Go on a sugar fast – Commit to at least five days without any sugar at all. Read your labels carefully, many foods are loaded with sugar. Although this will not be easy, your body will thank you. Do not use artificial sweeteners – Many people have the wrong impression that artificial sweeteners will help them end their craving for sugar. In fact, these make it harder to quit and only encourages you to eat sugar-laden foods. If you need something sweetened, use coconut crystals, raw stevia or raw honey (in moderation). Hey Buddy!, I found this information for you: "Is Your Second Brain Addicted to this Substance?". Here is the website link: https://www.thealternativedaily.com/second-brain-addicted-substance/. Thank you.